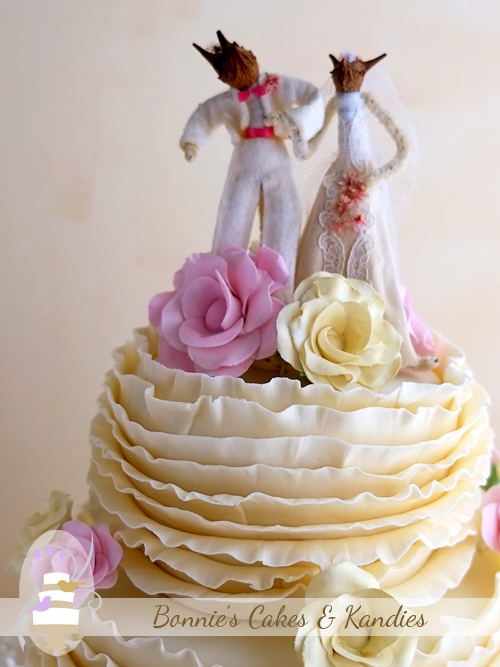 Last January, three uninvited guests showed up at two weddings that I had made cakes for, both of which were scheduled on the same day. These troublesome guests – rain, wind, and rising floodwaters, certainly made their presence felt! While one of the two weddings had to be postponed, the other went ahead on the original date, despite many last minute changes of plan. You can read more about that wedding by clicking here, where you’ll also see one of my favourite images from Michelle Schulga Photographer! 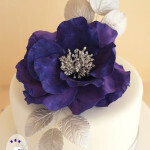 This January saw another challenge for a beautiful couple who had chosen me to make their wedding cake: extreme heat! The day went on as planned, though, and Promise and Shane were married in front of friends and family by Michelle Gadd Registered Civil Celebrant. Not letting the heat get her down; I was very happy to see that Promise had a big smile on her face when I delivered the cakes. 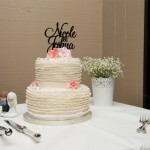 It was too hot at that time to set up the cutting cake in its final position for the reception, but I did take some photos before delivery, and am delighted to be able to share them with you below. The gorgeous couple chose a dark chocolate mud cake with white chocolate buttercream icing for their kitchen cake, and decorated two tier cutting cake. 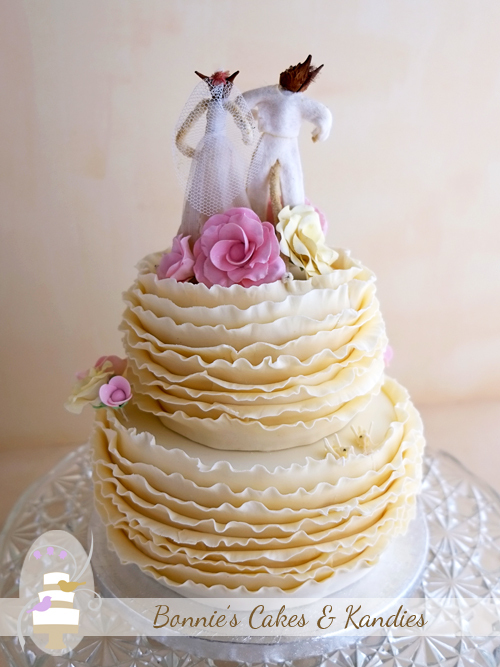 The cutting cake was made in a different flavour for each tier: white chocolate mud cake for the top tier, and dark chocolate mud cake for the bottom tier. 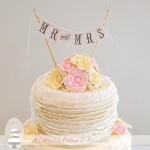 All covered in my handmade white chocolate fondant, the cutting cake was decorated with beautiful, delicate ruffles, each individually cut, applied and shaped by hand. Pink and champagne coloured icing flowers were arranged on the top and sides of the cake, and of course, my signature doves made an appearance at the back of the cake. Promise and Shane supplied the kangaroo bride and groom cake toppers, which made such a difference to the overall look of the cake. What a very cute and unique pair they are! 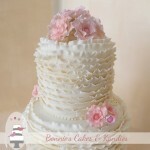 White and dark chocolate mud cake make up the tiers of this romantic, ruffle wedding cake with icing flowers and kangaroo cake toppers, made for a gorgeous Gympie wedding. Best wishes to Promise and Shane for a wonderful life together…and here’s hoping the weather is a little kinder next January when they celebrate their first anniversary of marriage!